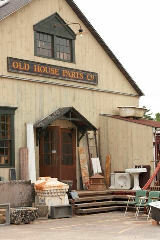 The Old House Parts Company has been an American Architectural Salvage mecca for homeowners, builders, designers, architects, artists and enthusiasts from all over the country since 1996. Situated in an 11,000 square foot 1872 freight warehouse, it is a revolving museum of genuine architectural salvage including antique windows, doors, hardware, stained glass, lighting, fireplace mantels, moldings, wainscoting, bead board, paneling, stair parts, claw foot tubs, sinks, iron, stone, masonry, old wood flooring and more. A collection of 3,000+ salvaged, antique doors grouped by panels can only be seen to be believed. The thousands of antique doorknobs, back plates, locksets and hinges, are all sorted by style and size for your convenience. There is hundreds of antique stained glass and leaded glass windows, with many perched on ledges for easy viewing. Thousands of linear feet of salvaged wood and flooring are available for endless uses. Daily, visitors are astonished by the meticulous organization of the inventory and impressed by the friendly, helpful expertise of the staff all supervised by the knowledgeable Mike Thompson who has been with OHPC for over a decade. The Old House Parts Company founder and owner, Tom Joyal, discovered his passion for American Architectural Salvage during his years as a contractor working on numerous home restoration projects. It wasn’t long after witnessing volumes of high quality, architectural craftsmanship being tossed into dumpsters that Tom decided to rescue these treasures from landfills and make them conveniently available to those seeking to add quality and character to their homes and properties. 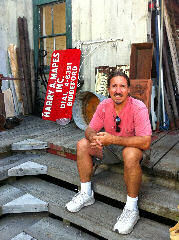 His determination has led to the establishment of The Old House Parts Company. Our primary focus at OHPC is providing 18th, 19th and early 20th Century American Architectural elements for historical restoration and home improvement. With our knowledgeable staff and Tom’s 30 years of experience in carpentry, custom woodwork, contracting and architectural salvage, we will work with you to meet your genuine old house restoration and interior design needs. We are experienced in designing and fitting retail establishments, restaurants and large spaces with architectural salvage details. No detail is too small, from finding the right replacement drawer pull to outfitting an entire building with genuine, period appropriate windows, doors and hardware, we can help you. OHPC is the ultimate in reusing, recycling and repurposing while adding warmth and craftsmanship to your home. 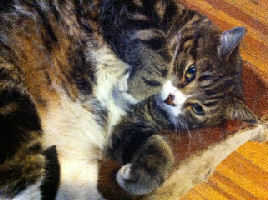 Also, don’t forget to say hello to the resident feline, Napoleon, who has his own following with customers at the Freight House!